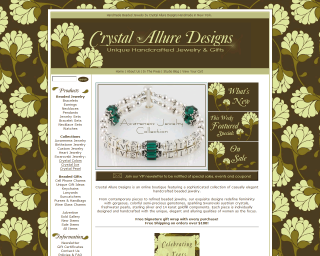 Okay, my husband and I have a differing opinion about the new look of the Crystal Allure Designs website. I feel it looks great -kinda "funky" but not too overboard, fresh look for spring, etc. He feels it looks "cluttered" as best as I can describe his view of it. So, tell me -what do you think about it? Do you like the look for Crystal Allure? What about the colors? Feel free to leave a comment, I'd love to hear from you! I love the banner but I think the flowers in the background do take the attention away from your jewelry. Hope this helps. I like the new design...I think it's pretty for spring!